To comply with my non-disclosure agreement, this case study is a fictional representation of a project. Confidential information that could reveal details of the project have been obscured or omitted. Zattoo is the leading service in Germany and Switzerland for Live and On-Demand TV streaming. Zattoo users can enjoy over 200 TV channels, watch programs up to 7 days after the air date and record their favourite TV shows. The app is available for Mobile, Tablet, Desktop and TVs. Additionally, the company offers a white-label TV solution to B2B customers such as 1&1 and Salt. The redesign of the feature was aimed to improve the performance of Zattoo's strategic KPIs, together with elevating the design and user experience of the product. Additionally, the company and the Design Team were aligned in using this redesign as a benchmark to step up and revisit the design process. Prototyping, Interaction Design, User Testing, Google Ventures Design Sprint. Prior to the redesign, the UX department collected insights from relevant past studies. Additionally, the team worked together with the Business Intelligence department to set-up a dashboard to track the KPIs. At the same time, the Customer Service team collated a list of issues related to the feature. Once the data was collected, my responsibility was to organise and lead a GV Design Sprint workshop with the relevant stakeholders. This step was crucial to define the problem, align business and users needs, and manage expectations. Based on the sketches generated during the GV Sprint, the team designed a concept for tablet. InVision and Sketch were used to create a prototype to test our hypotheses. The testing revealed that most of our hypotheses were correct. All findings were incorporated into the concept/redesign. Subsequently, the web/mobile team adapted the tablet concept to smartphone and desktop. Tablet user testing - The team taking notes in the observation room. 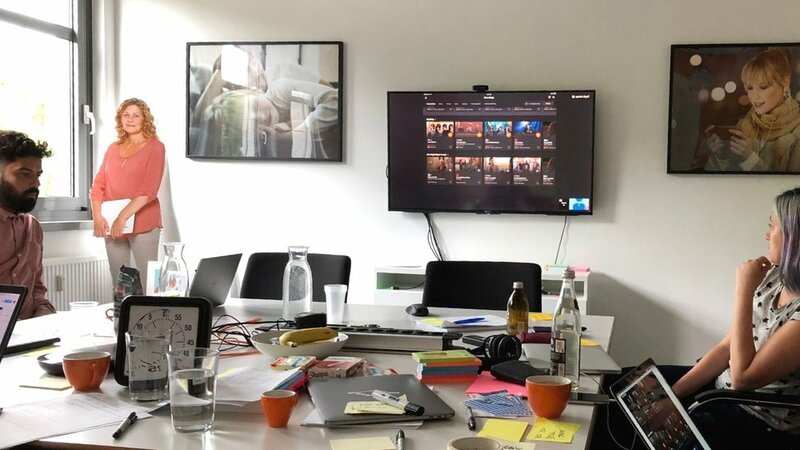 Once the mobile/web team went into development mode, I adapted the concept/redesign to Zattoo’s apps for Apple TV and Fire TV in collaboration with a Visual Designer. On TV interfaces the focus is on consumption, but we incorporated some management options as we had evidence of this user need. I paired up with a tvOS Software Engineer to build an interactive prototype for Apple TV. It was a win-win situation. The prototype was realistic and the tech team was able to reuse code for final development. During the development process of the 10-foot UI app, I collaborated with Software and QA Engineers to make sure that the User Experience and look&feel of the feature were developed and shipped in accordance with our efforts.